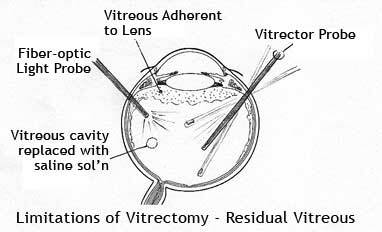 Vitrectomy refers to the surgical removal of the vitreous humour, the clear jelly in the main chamber of the eye. The procedure’s name derives from the way surgical instruments are introduced through the pars plana, the thin flat part of one of the three layers that comprise the eye. Vitrectomy is a complex microsurgical procedure which is usually performed by an ophthalmic surgeon with special training. As with all surgical procedures, vitrectomy surgeons have developed a number of techniques, so there is some variety in approach and outcome amongst doctors and clinics. Generally speaking, the surgeon views the interior of the dilated eye through a microscope and special lens designed to provide a clear image of the back of the eye. In the traditional 20-gauge PPV an infusion line is sewn in place to introduce replacement fluid to maintain the eye’s shape during surgery and then two tiny incisions are made in the 10 and 2 o’clock positions through which a light pipe and cutter are inserted, the vitreous is removed and replaced with a temporary vitreous substitute (gas and/or oil). Afterwards the instruments are removed and the incisions stitched (sutured). Alternative sources of illumination, such as chandelier lights or illuminated picks, allow for two-handed surgery. More recently, the development of thinner 23-gauge, 25-gauge and 27-gauge instruments have allowed for smaller, unstitched (sutureless) incisions for some patients. In the Transconjunctival sutureless vitrectomy (TSV), small tubes or canulas or trochars are placed through the pars plana area and very tiny instruments are placed through these tubes. Once the surgery is complete, the tubes are removed and no stitches are needed. Eventually the chamber will be refilled by aqueous humour, a clear watery substance that the eye produces. Pars plana vitrectomy (PPV) is typically performed to relieve a variety of conditions which threaten the health of the eye or obscure light as it passes through the eye to the retina. It has a well-known risk profile and there is reluctance to offer this surgery to treat floaters unless they obscure vision and/or significantly reduce quality of life. The main post-operative complications that one must worry about in vitrectomy are infection, development or progression of nuclear sclerosis cataract (30-40%); retinal detachment and choroidal bleeding in the eye (5-10%). In eyes that have an established posterior vitreous detachment (PVD) where the vitreous has detached itself from the retina, there is a lower incidence of both intraoperative and post-operative complications. Some scientists argue that the vitreous performs an important physiological task that is essential to the eye: it consumes oxygen and protects the eye from oxidative damage. A vitrectomy for other purposes is not the same as vitrectomy for floaters only (FOV). The duration of a floater only vitrectomy is approximately 30 minutes (now only 15 minutes with Sutureless Vitrectomy) compared to one or two hours for the vitrectomy associated with other eye problems. The unique circumstances of each patient will determine the amount of vitreous removed; in most cases, vitreous near the lens is left in place and the retinal vitreous may or may not be removed dependent upon the state of PVD. For these reasons, this type of vitrectomy is referred to as a Core Vitrectomy. Floater only vitrectomies incur fewer complications than general vitrectomy, due to the selective removal of vitreous material. However, limited vitreous removal may result in remnants of floaters remaining even after surgery; some patients report being able to see the edges of their vitreous, which they claim is very annoying. In 1975, O’Malley and Heintz described the use of a 20-gauge, 3-port system. This became the gold-standard for the next three decades. Over the past several years, the development of small incision transconjunctival, sutureless PPV has led to a major shift in how many diseases are treated in the operating room. In 2002 Fujii et al introduced the modern 25-gauge PPV system, while Eckhart endorsed 23-gauge PPV in 2003. 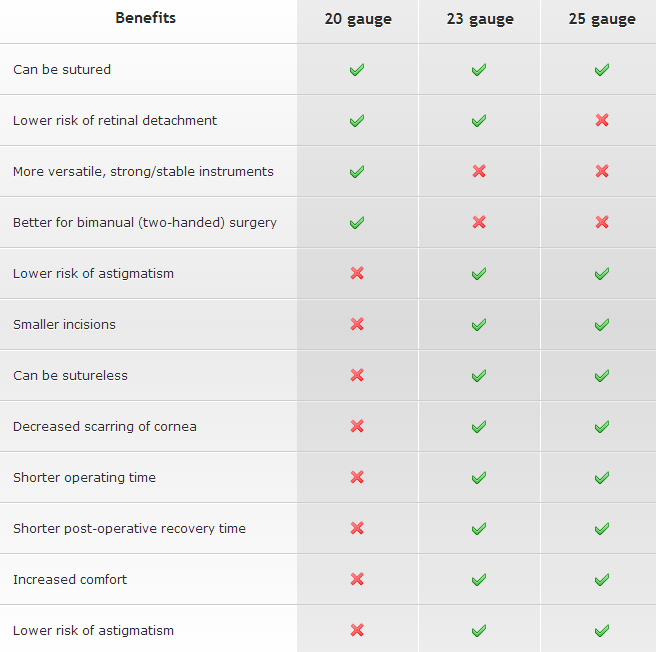 Today, ophthalmic device makers market 20-gauge systems, which require sutures, and 23- and 25-gauge systems, which do not. 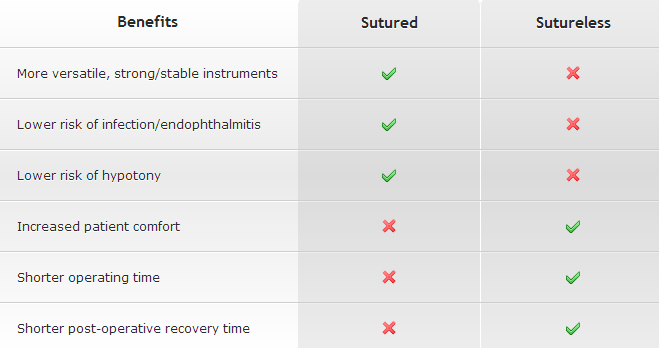 Advances in vitreoretinal surgery have included the development of suitable vitreous substitutes. Air, balanced salt solutions, perfluorocarbons, expansile gases, and silicone oil serve integral roles in modern vitreoretinal surgery. Vitreous substitutes vary widely in their properties; serve different clinical functions, and present different shortcomings. Permanent vitreous replacement has been attempted with collagen, hyaluronic acid, hydroxypropylmethylcellulose, and natural hydrogel polymers, unfortunately none have proven to be clinically viable. So far a long-term vitreous substitute hasn’t been found, but recent research suggests promise in the area of synthetic polymers. Tan, H Stevie et al. “Safety of Vitrectomy for Floaters.” American journal of ophthalmology 151 (2011): 995–8. Wilkinson, Charles P. “Safety of Vitrectomy for Floaters – How Safe Is Safe?” American journal of ophthalmology 151 (2011): 919–920.e1. van den Biesen, P R et al. “Endoillumination During Vitrectomy and Phototoxicity Thresholds.” The British journal of ophthalmology 84 (2000): 1372–5. Kleinberg, Teri T et al. “Vitreous Substitutes: a Comprehensive Review.” Survey of ophthalmology 56 (2011): 300–23. Goldsmith, C., T. McMullan, and T. Burton. “Floaterectomy Versus Conventional Pars Plana Vitrectomy For Vitreous Floaters.” Digital Journal of Ophthalmology 2011.04/07/2011 (2007): n. pag. Cho, Young Jae, Jun Mo Lee, and Sung Soo Kim. “Vitreoretinal Surgery Using Transconjunctival Sutureless Vitrectomy.” Yonsei medical journal 45 (2004): 615–20. Lipner, M. “Some Patients Willing to Take Risks to Rid Themselves of Floaters.” EyeWorld (2011): n. pag. Trese, M T. “Enzymatic-assisted Vitrectomy.” Eye (London, England) 16 (2002): 365–8. Delaney, Y M, A Oyinloye, and L Benjamin. “Nd:YAG Vitreolysis and Pars Plana Vitrectomy: Surgical Treatment for Vitreous Floaters.” Eye (London, England) 16 (2002): 21–6. Fabian, Ido Didi, and Joseph Moisseiev. “Sutureless Vitrectomy: Evolution and Current Practices.” The British journal of ophthalmology 95 (2011): 318–24. Print. Fujii, Gildo Y et al. “A New 25-gauge Instrument System for Transconjunctival Sutureless Vitrectomy Surgery.” Ophthalmology 109 (2002): 1807–12; discussion 1813. Print. Holekamp Nancy M. “Vitreous Research: The Oxygen Story” Retinal Physician 9 (2012): 21-23.